PHOENIX – Army Capt. Frank Vargas, a former Arizona Guard and 173rd Airborne member, was awarded three Purple Hearts here June 25. The Purple Heart is the oldest military decoration still given to U.S. military members and is awarded to those killed or wounded while serving in combat. 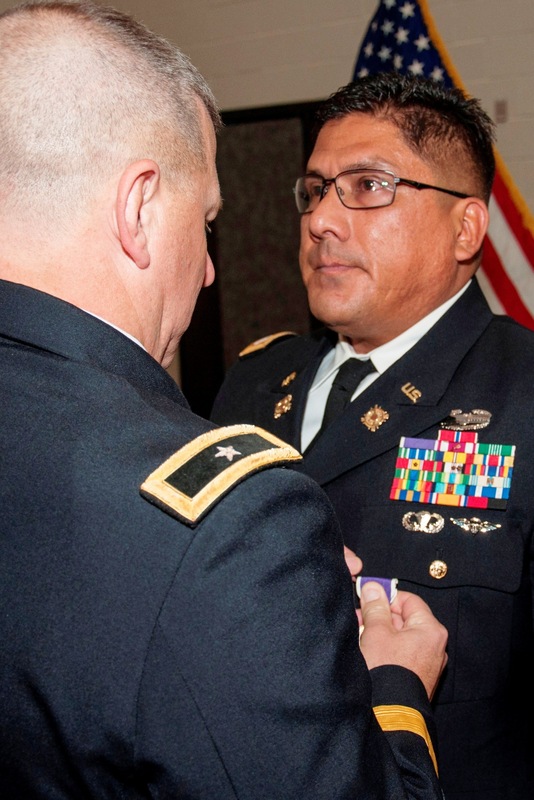 Vargas received the decorations for three separate actions: Sept 15, 2010, while conducting village clearing operations in Southern Afghanistan, March 2011, from incoming rocket fire, and July 4, 2011, from an improvised explosive device while conducting route clearing operations. When talking about those closest to him, Vargas became overcome by emotion. “The most important thing was always my family and taking care of Soldiers. I’m glad to be home. These are not tears of pain, they are tears of happiness,” Vargas said. Army Brig. Gen. William Hall, land component commander for the Arizona Army National Guard, retired Vargas during the ceremony. “Thank you for being a great warrior, thank you for being a great Soldier, and thank you for having the desire to serve your country and the state of Arizona,” Hall said. Strahl attended the ceremony to honor his close friend and award him the Meritorious Service Medal for his achievements while serving at the 173rd. “He is a generous and kind individual and strong Army leader,” Strahl said.